For the Ainu (see Japanese Wolf Gods), the indigenous population on the island of Hokkaido, northern Japan, the wolf was an important god, Horkew Kamuy, the "Howling God" (also Horkew Retara Kamuy "White Wolf God" or Horkew Kamuy-dono "Lord Wolf God"; N.B. : kamuy is more or less equal to the Japanese word kami, 'god', 'divine spirit', etc.). There are myths of a white wolf that mated with a goddess, and the offspring from this union became the ancestors of the Ainu people... (see comparable North American Native and Mongolian creation myths). "Interestingly, in Ainu lore, wolves usually were friendly toward people, as in one story from Tokachi in which a wolf saved an elderly Ainu woman from an evil bear god while she picked wild plants". "In an earlier Ainu world, a world yet to be disrupted by the Japanese intrusion from the south, the landscape was alive with wolves, busily hunting deer, raising their young, and, at magical times, aiding people and descending from the heavens to inhabit sacred moutains and forests, much as wolves did in the tradition of some Japanese villages." (Walker 2008). Ainu villages are also said to have raised wolf cubs and then used them as hunting companions. The spread of western influence and Japan's "modernisation" in the 19th century sparked off strychnine poisoning campaigns and the indigenous wolves of Hokkaido, like in the rest of Japan, became quickly extinct (already in 1889). Still essential reading!!! Fairley Mowat's "Never Cry Wolf"! An Aztec deity depicted with the head of a dog. We find two interesting parallels with the role of wolves in other cultures: he accompanied the dead through the Otherworld, and he also carried the sun on its/his way through the night. Excursion to Africa and Eurasia! According to the Serer religion of Senegal, the wolf was the first living and the first intelligent creature to be created by the supreme (creator) god Roog (cf. H. Gravrand 1990, La Civilisation Sereer - Pangool, vol. 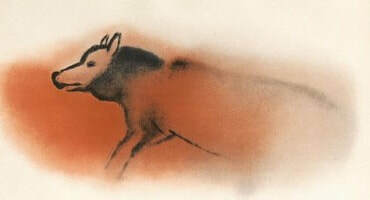 2, 201-3): the wolf is seen as a seer 'who came from the transcendence' and who maintains links with it: therefore, the wolves' movements are carefully observed; it is believed that wolves know in advance who will die, and also that the wolves will remain on earth even after the humans (see Gravand 1990). Back to Eurasia where the Chechens are, according to national myth, "born of a she-wolf" (which superficially may remind us of the role of the Roman lupa). The lone wolf symbolizes strength, independence and freedom. A proverb about the teips (subclans) is "equal and free like wolves" (cf. K.S. Layton 2014. Chechens: Culture and Society, pp. 62–63). "Beyond are the Hirpini, who are also Samnites: their name they take from the wolf, which conducted their colony; a wolf being called by the Samnites hirpos" (Silv. 4.8.45): see section on Italic wolf cults. In the chapter "The Dacians and the Wolves", M. Eliade (Zalmoxis, The Vanishing God. 1972, 5-20) shows that the Dacians, Daci, considered the blue/grey (she)wolf their mythical ancestor (for blue wolf, cf. Mongolian/Turkish mythology). They called themselves "wolves" or "those who are like wolves"; the wolf provided an exemplary model of the warrior; imitating the wolves' behaviour was important, as well as initiation into "secret wolf warrior brotherhood" (Eliade, Story of Religious Ideas, vol. 2, p. 481). Le loup évanescent. 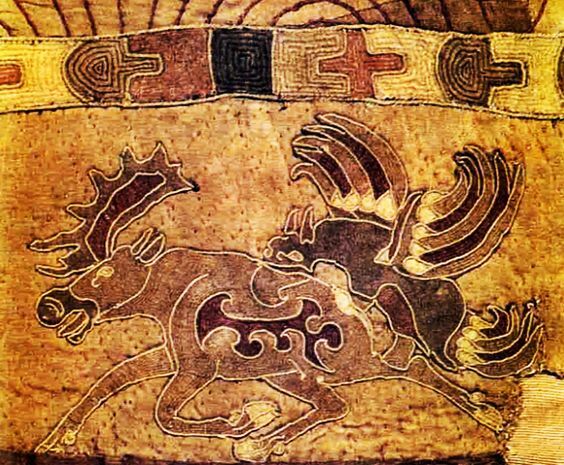 Cave painting of a wolf, one of he more mysterious figures from the famous "Font-de-Gaume" cave in Aquitaine, located at a topographic crossroad of the cave; it dates to the Magdalenian period, c.17,000 to 12,000 BC (today not much of this painting is visible; this image comes from "La Caverne de Font-de-Gaume aux Eyzies" by Louis Capitain, Henri Breuil and Denis Peyrony, 1910, planche 37). A bone depicting two wolves, discovered at the "Grotte de la Vache" (Haute-Ariège, France, dating to Magdalenian period, c.14,000 BC; see http://www.grotte-de-la-vache.org/). Among the North American Native population, we also find the wolf as creator god. We are dealing with different forms of creation: the creation of the world and the creation of humans. 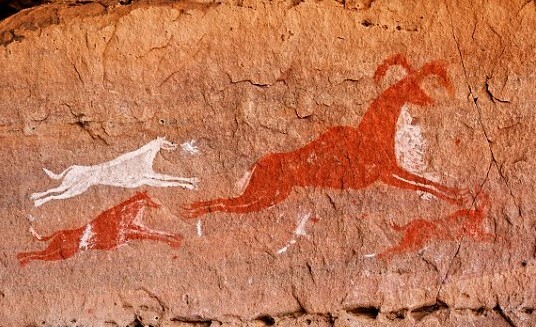 In the Kaibab Souther Paiute belief, for example, the most prominent of all beings was the wolf, "the powerful one, as he was the People's Father" and created heaven and earth (cf.Handbook of N American Indians: Great Basin, p.638). And in the mythology of the Shoshone, the wolf was a noble Creator God. In one myth of the Shoshone, there was a (primeval) flood, and Wolf and Coyote were threwing down soil, from the upper world, into the world ocean, thus creating the earth (cf. e.g. Handbook of N American Indians, p.638 with further references). 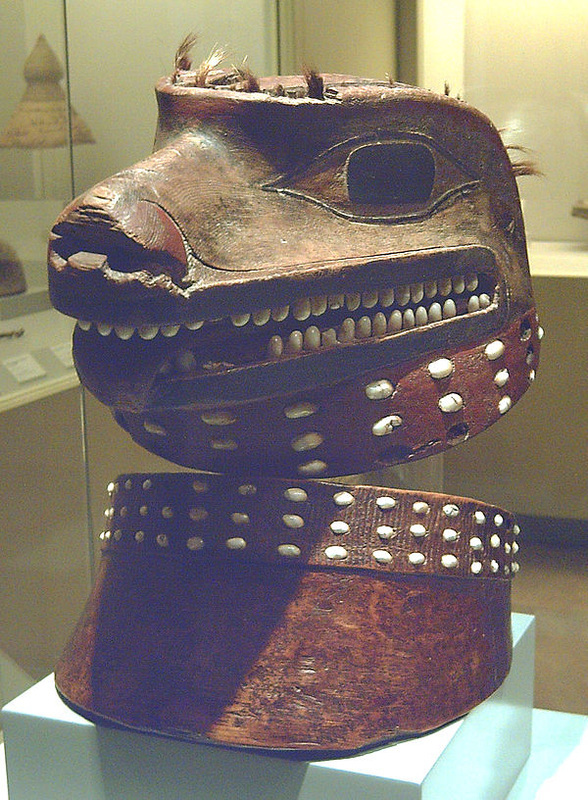 Wolf-like mask and collar from the Tlingit people on the Pacific Coast of NW America (Madrid, Museum of the Americas). Wolves are considered closely related to humans by many North American peoples. And acdcording to origin stories of some North-West Coast tribes, such as Quileute and Kwakiutl, people's first ancestors were transformed from wolves into men (see Ainu myth, supra). Among the myths of the Kwakiutl (British Columbia), we learn how the ancestors of that people took off their wolf mask and became humans (cf. Steinhart, Company of Wolves, 1996). 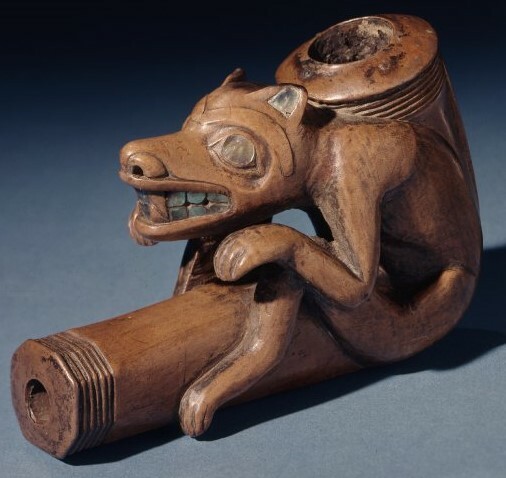 This mythical transformation from Wolf to Man can still be seen today in the rituals of the Quileute in NW America; there we find the Tlokwali, the "Wolf Ritual" which was held in winter; it seems to reflect this mythical transformation, while at the same time being an initiation (rite de passage) of new initiates/novices into the community (coming-to-age ritual). It is a long ceremony; among others, it started with the new initiates, on the first evening, imitating the cry of the wolf, outside the village or in a burial ground; the next day, all the members of the Tlokwali appear "behaving themselves as wolves", entering the specially built Tlokwali house crawling on their hands and feet, some covered in wolf skins, and wearing carved wooded headdresses (see images below). After some recitations, a signal from the Fathers is given and the "wolves", the novices, rush out of the Tlokwali house, throw away their masks, and get their everyday clothers on, then they re-enter and dance. The six-day ritual continues with numerous rites; at the end, each participant will have their "guardian spirit from the woods". All this reflects an initiation ritual, and the 'wolf' also, in a way, serves as model for family life (see detailed description of this ritual by Frachtenberg, in American Anthropologist). The Pawnee were known as the Wolf People (esp. by other peoples/tribes [cf. Swanton, Indian Tribes of N America, p. 289], and the wolf is today part of the Pawnee's nation seal). The cyclical appearance and disappearance of Sirius, the Wolf Star, indicated the wolf coming and going from the spirit world, running down the trail of the Wolf Road (i.e. the Milky Way); the Blackfoot tribe also called the galaxy the Wolf Trail or the Route to Heaven.(cf. e.g., "Wolf Legend and Lore" and http://www.native-languages.org/legends-wolf.htm ). Among the Pueblo tribes, wolves are considered one of the six directional guardians, associated with the east and the colour white. The Zunis carve stone wolf fetishes for protection, ascribing to them both healing and hunting powers (cf. http://www.native-languages.org/legends-wolf.htm). Sorry, but this section is still rather incomplete. More as soon as I find the time. We already have seen that people seem to (have) dress(ed) up as wolves during religious ceremonies, for example in the case of the Tlingit (see above). There is more evidence for this ritual from various cultures. For example, the Navajo word for wolf, "mai-coh," also means 'witch': a person could transform if he or she wore a wolf skin. This is something that we also find in other cultures, e.g. ancient Greek world (Dolon - see Greek Wolf Myths) or the Iberian herald dressed up in wolf skin (see Celtic Wolf Myths).